Well, we finally got it done, although the rainy days skewed up our schedule a bit. 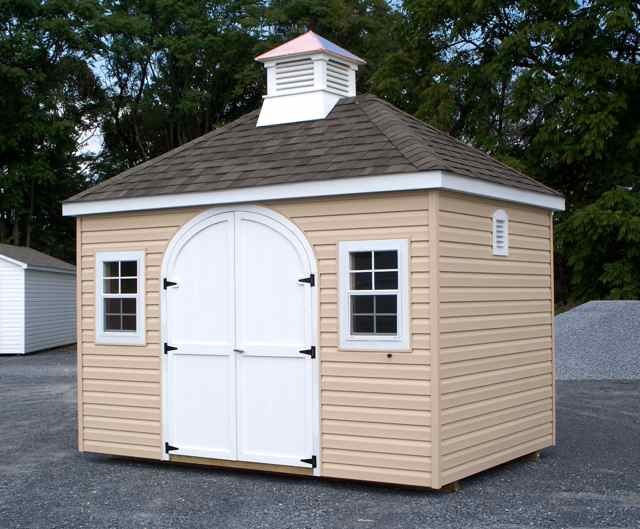 I’m talking about a beautiful, custom, Manor Shed design that we built for customers in Elizabethtown, PA., this week. It seemed to rain – hard – every time we had the shed site prep scheduled for this particular customer. I’m sure it started to get them discouraged, but mother nature is beyond our control. Site Prep is when our crew goes out to the customer’s property to prepare the site where the shed will be placed. A proper site preparation, also called “a pad”, entails our crew going out with a skidloader and a dumper (ours is affectionately called “big red” or Clifford) full of crushed 3/4″ stone. (I like to call the skidloader Wall-E because it reminds me of that little creature in the Pixlar movie). But, I digress. To prepare the pad, we measure out the size of the shed, add 12″ all around, and start to dig down with the skidloader about 4-6 inches (depending on the lay of the land). We can either haul that extra dirt away, or leave it for the customer to use for other uses around the house. Then the dumper jumps into action and fills that area with the stone, while our guys level it out. Sometimes a border is required, sometimes not. So anyway, it seemed that every time we planned on getting this particular site done, it would rain. Hard. (I realize I am repeating myself here, bear with me!) We really don’t like to drive all of this large equipment onto someone’s wet yard, so we need to re-schedule and hope it doesn’t rain again for the new date. Our other delay for this particular shed was the backorder for the custom vinyl siding that the customer selected. Our standard vinyl siding is a dutch-lap style, which is a very popular type of vinyl siding. But some customers have a particular manufacturer or style/color on their home, and they would like to use the same vinyl siding on their shed. We have access to all manufacturers and can easily order whichever siding the customer selects to upgrade to. However, we cannot always control the distributor’s shipping schedule. So, this Wolverine Natural Clay siding was delayed as well (and we can’t blame mother nature for this!). Finally, the site prep was done and there were a few clear, sunny days predicted for this part of the Susquehanna Valley here in Lancaster County. What had us so concerned about the nice weather after the site prep was done was that this particular shed was to be “built-on-site”. Since there was no access for a delivery shed trailer to bring in the shed pre-assembled, our crew pre-built the majority of the walls, doors, etc., in our shop and built the entire shed “on site”. It is usually a site to behold! Like an old fashioned barn-raising, our crew can usually have the shed up in just a matter of hours. For a truly customized shed, this may take a bit longer. We also have shed kits available for customers who choose to build the shed themselves. After two days of building, the custom Manor shed is done! We are excited about it, and the rest of us in the office at Fox’s Country Sheds were anticipating seeing photos of it. Unfortunately, someone forgot to take a photo! Not mentioning any names though (Brad!) 🙂 Hopefully we will have time to go back this week and take some nice ones to share. Until then, we will all have to use our imagination (including you)! Below is what the standard Manor Shed looks like. We’ll post pics (as soon as we can) of the custom designed “build-on-site” shed we just completed.